This page expands on the results published in the paper: Campbell Ian, 2007, Chi-squared and Fisher-Irwin tests of two-by-two tables with small sample recommendations, Statistics in Medicine, 26, 3661 - 3675. Fig. 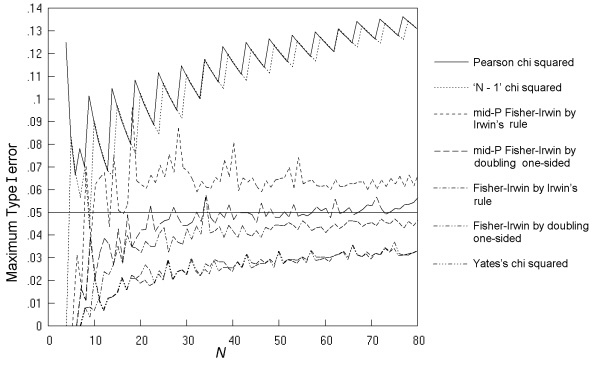 5 gives the maximum Type I error across all values of π and all possible m, n pairs at a nominal α of 0.05 for the seven two-sided tests, as a function of N. The findings replicate those of previous studies, with rates considerably higher than the nominal for the K. Pearson and 'N - 1' chi squared tests. The mid-P Fisher-Irwin test by Irwin's rule also has rates that are too high, but to a lesser degree. Of the remaining four tests studied, the mid-P Fisher-Irwin test by doubling the one-sided value performs closest to the nominal, with a good match at N over 30. As in previous studies, Yates's chi squared and the standard Fisher-Irwin tests have rates much lower than the nominal 0.05.